It’s always a leap of faith to entrust your private business data to a third party. But if you’re like many companies who find maintaining an in-house tech team is not a practical solution, managed IT services can be just what you need, offering benefits you may not expect. Most businesses have limited IT resources, don’t have the internal staff necessary to handle or implement software programs, and don’t want their tech professionals distracted from driving new solutions for the business. Many of them have also sought to downsize internal support teams so to balance productivity with minimal overhead. With outsourced IT services, you can reduce your in-house tech arsenal and let a third party do the heavy lifting. There are plenty of reasons to support this strategy. Here are what we consider the top 5 benefits to outsourcing network support through managed services. 24/7 remote monitoring and production of reports that keep you up-to-date on the state of your systems. Notifications of maintenance requirements and security alerts. Proactive prevention of any authorized network access. Risk assessment, compliance assistance, and correlation analyses that provide you with a consistent overview of network activity. The value of reliably managed network security to your data system’s safety and health cannot be overstated! The best managed services provider offers quick response times and innovative solutions to any software or hardware errors you encounter. And since the 9-to-5 work day is quickly going the way of the dodo, staff who work around the clock need assistance at all times. An MSP’s certified technicians are available 24 hours a day to assist you in diagnosing and correcting IT problems. And when your company needs a new program implemented, an MSP can immediately have it up and running with network wide compatibility. In-house tech personnel come at a high cost. Outsourcing IT managed services helps you avoid the expense of retaining a big internal staff and lets you allocate resources towards expanding your business. The time and money you’d spend on upgrading and implementing new tech services can instead be reserved for long term, growth-focused goals. And once you switch to outsourcing, you always know what your month-to-month expenses will be. Need to scale up your system for a special project or to accommodate growth? You can easily adjust and pay for what you need depending on your computing needs. Many businesses are obligated to meet standards and requirements with their IT initiatives. When you outsource to an MSP that is familiar with compliance standards, you minimize risk related to client data, privacy, and any other sensitive information, taking the burden off in-house staff and placing it with someone who understands the regulations pertinent to your industry. In the world of tech, new challenges, issues, and solutions emerge every day. In-house IT staff typically have knowledge and experience with problems known to your company. MSP technicians, on the other hand, have experience in a much wider range of computing issues. Faced with a new IT-related problem? Your MSP likely already knows how to fix it, as the professionals there constantly undergo training in the latest technological advances. 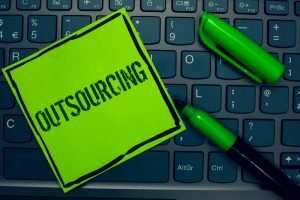 Is it Time for Your Company to Outsource IT Through Managed Services? Providing scalable and customizable technology solutions. Delivering superior tech platforms and tools in comparison to market competitors. Offering managed security service that provides a high level of automation, security testing, and the flexibility to adapt to changing industry requirements. Finally, keep in mind an MSP does not need to replace your in-house IT staff. A good managed service provider can partner with your employees or act as a full tech support team, ensuring you have the least complex and most cost-efficient systems. Ultimately, the dual goals of outsourcing are to make sure your company’s day to day operations run smoother and to support its strategic business goals.